Yesterday I gave a presentation titled “Smartphone Shorts” at Tufts University which was part of the Boston International Kids Film Festival program. This post provides follow-up notes I promised to share with participants. For a good introduction to visual storytelling, regardless of the camera you are using, read Visual Storytelling by Nancy Kalow, an e-book published by the Center for Documentary Studies at Duke University and available as a free PDF download. 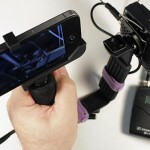 This is one of the best introductions to making short documentaries using a camcorder, D-SLR camera, or mobile phone. Another good resource is the book Filmmaking for Teens: Pulling Off Your Shorts by Troy Lanier and Clay Nichols, it presents a methodical and readable introduction to making short videos. 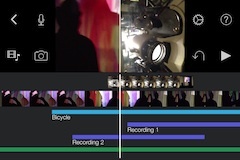 The standard video recording app on the iPhone is no frills. Once you have been shooting video for a while you’ll start expecting more from the camera and FiLMiC Pro is a video recording app that provides a range of features that turns the iPhone into a pretty good video camera, giving you manual control over things like exposure, frame rates, resolution, and other key features like slow-motion, time-lapse, aspect ratio guides, and high-quality encoding. The bare bones FiLMiC Classic is only $0.99 while the full-featured FiLMiC Pro sells for $4.99. There’s nothing quite like it for the Android yet. For iPhone owners the latest version of iMovie ($4.99) provides a straightforward and easy way to edit and share videos with your iPhone or iPad (it’s also available for MacOS). I think it does a nice job of mixing multiple audio tracks and automatically ducking music under the voice-over you record in sync with picture. iMovie provides a variety of templates for videos, however, the “simple” template turns out to be the best and least cheesy way to go when it comes to editing. While I wish iMovie offered a wider range of effects and editing options, for the price it’s a good basic app to start editing with. The current version does not allow moving the project to iMovie on your Mac (as the previous version did) but this is expected to return in a future update. The current version does crash on me once in a while, so I hope future updates will deliver a more reliable editing experience. If you’ve got an Android phone two editing programs you might want to take a look at are Movie Editor from Goseet ($2.58) or Magisto Video Editor & Maker (Free, w/ in-App purchases for additional features, available for both Android and iOS.) I can’t say much about them because I don’t have an Android phone and thus have not actually used them myself. Another alternative for editing, especially if you’re on a tight budget and want a basic editing system that will not break the bank, consider Adobe Photoshop Elements & Premiere Elements ($199.99, available for both Mac OSX and Windows). For iPad users who outgrow iMovie, you might want to to take a look at Pinnacle Studio from Corel ($12.99) which looks like an intriguing option (though I’ve not used it myself). If you want more capabilities than iMovie and other basic tools can provide, what’s next? If you’re on a Mac, the next step would be to move up to Final Cut Pro X, a full-featured editing system that’s surprisingly easy to learn considering what it can do. A cross-platform alternative that’s a proven professional workhorse is Adobe Premiere Pro which I like because of the integration with Audition (for sound work) and After Effects (for motion graphics work). While Final Cut Pro X is a new application (not to be confused with Final Cut Pro version 7 and prior, which is similar in name only) Premiere has been around for a while and has more in common with earlier version of Final Cut Pro that X itself does, curiously. I will answer additional questions if you post them as comments to this post. Minor updates were made to this post on November 5 and 7, 2013 to correct typos and clean up some wording. It’s so handy to shoot with the iPhone camera because I always have it with me, but the quality is limited. David showed us how to circumvent that, to get steadier shots, better sound, and more professional quality. My favorite part of the workshop was watching the kids connecting, asking questions, showing videos that they’ve made (some very sophisticated!). This next generation is going to do things we never envisioned, including making great films on their iPhones. Bravo for a great workshop, David!